Leehom ordered this right after he saw "The Alien" on Guitar Noize. It was produced by Emerald Guitars. 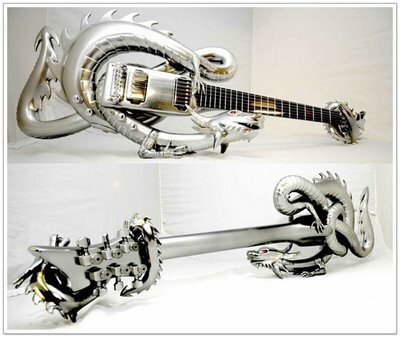 Bahamut went on Music Man World Tour with Leehom since September 2008. Read more about Bahamut at Guitar Noize, or read Allistair's Blog, the person who has finished the production in 6 weeks time! Hi - I'm also a huge fan of Leehom :) It's nice to see an updated English blog for him. He named his guitar Bahamut because of a role-playing game he used to play when he was a kid. He explained it in the Music-Man DVD. My sister has my DVD so I can't double check but if I remember correctly, he said he and his brother were nerdy kids who used to play a game called Dungeons and Dragons and there were 2 dragons in the game - one good and one evil. Bahamut was the name of the good dragon. and yeaa.. I'm trying to catch up with his busy life and schedule, but he seems nowhere to be found these days.. I know he's doing movie editing but I also hope he's finishing his album too. No problem. And I do wish the DVD came with English subtitles. My understanding of Mandarin is pretty limited. The China fan club keeps pretty up to date with his news but it doesn't help people who can't read Chinese :) Not sure if you saw the interview while he was in Singapore over the weekend but he said his album is connected to his movie so I think they'll both be released at the same time. Language barrier is the only complaint I have of being Leehom's fan. I really think he should hire a professional staff to take care of his non-chinese speaking fans, like me. If he wanted to go International, he really should consider it. I didn't know if he will link the album to the movie coz, he's been preparing the album long before he's start making the movie.. oh well, he always does surprise us, doesn't he? Thx so much for the vid link!